Based on 2011 interviews with Sally Donovan, the last owner’s wife; several former employees; and the author’s employment as a clerk from 1949 to 1952. Special thanks to John Lovett who suggested this story and arranged the interview with Sally Donovan and to Kathy Griffin for editorial assistance. Jesse James was busy robbing banks all over the Midwest; Alaska was annexed for a paltry $7.2 million, and England and France jointly rejected a cross-Channel tunnel connecting the two. 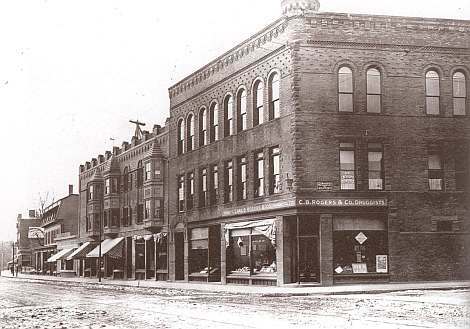 It was 1867 and as the Civil War was entering the Reconstruction phase, a 49-year old apothecary, or pharmacist, Charles B. Rogers, started the first drugstore in Jamaica Plain at the corner of Centre and Burroughs Streets. That store was destined to serve the Jamaica Plain community for 111 years until overwhelming economic and social conditions forced its closure in 1978. Right up to the end, the furnishings, fixtures, and professional environment, along with some unusual features in the store, impressed the estimated two million or so customers it served in those 111 years. Those customers included governors, mayors, judges, actors and vaudevillians, professional athletes and coaches, farriers, clergy and gangsters, teachers, the rich and famous, and the poor and needy of Jamaica Plain. They all had the common need for the little bits of chemicals the doctors prescribed to ease pain and extend their lives. Other visitors included those just interested in finding someone in the Boston City Directory, located near the door, with the store staff often filling in as genealogical consultants and Jamaica Plain street experts. Even the drop-in visitors just looking for the shoe store (Hanlon’s was upstairs) or those who just wanted to use the phone booth were given a “Thank you” when handing them their change for the phone. Those were the days when the customer was number one. Even when he didn’t buy anything, he was still a customer and the staff would hush whenever one entered — an unwritten store rule which called for empathy for a sick person or his caregiver. In 1902 an elegant black-onyx marble soda fountain was installed, and for 46 years it was watched over by a beautiful mirror that hung there until long after the soda fountain was removed. The wooden showcases, the handsomely carved and mirrored partition in front of the pharmacists’ work area, and the rest of the beautiful carved woodwork throughout the store were all original and kept in excellent condition despite a large volume of foot traffic, most of whom, it seemed, smoked heavily in those days. Passing through only five owners in its long life, C. B. Rogers held on to its high pharmaceutical industry standards, while large chain stores were driving out the small neighborhood drugstores throughout the country, and morphing into general stores with pharmaceutical sidelines, until 1978 when the last owner, John J. J. Donovan, was forced to close the store. This is a snapshot of what it was like to work there from the late 1940s to the late 1970s, some of the people who worked there, and what the ending was like. For many of us it was an unmatched work experience where drugs were dispensed ethically and compassionately; employees were respected, and every customer was treated with genuine caring. It’s gone now and greatly missed. When Charles B. Rogers started his drugstore in 1867, four years before our Civil War Soldier’s Monument was erected, we believe it was at 701 Centre Street, at the corner of Burroughs Street, in Jamaica Plain, although the City records don’t show him there until 1874. In 1878, Linville H. Smith, a clerk in the store, lived with Charles B. Rogers and his wife Caroline. As a New Hampshire native, he may have been related to Charles, whose roots also were in that state. They all lived for a time at the same 701 Centre Street address. When Linville Smith married Adeline, they moved to 51 Burroughs Street. A neighbor at 40 Burroughs Street, Ernest G. Lewis, started in the store around 1890. In 1893 Charles B. Rogers died and Linville Smith and Ernest Lewis took over the store. In 1898 Ernest Lewis’ son, Jack, was born and in 1924 Jack entered the store as a pharmacist. Around 1942, Ernest Lewis and his son, Jack, become the owners. In 1949 Ernest retired and Jack Lewis became sole proprietor. In 1965 John J. J. Donovan entered as a pharmacist and in 1970 he bought the store. 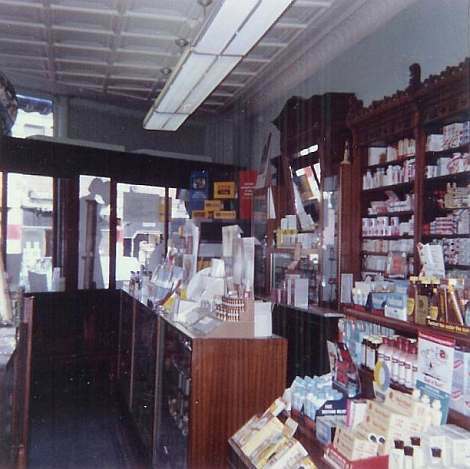 In 1978, due to the economic leverage of the large drug retailers, the growing crime against drug stores, and the stresses involved on the staff, his family and himself, Donovan closed the store, ending an unbroken run of 111 years serving Jamaica Plain’s doctors, dentists, hospitals and their patients. An estimated two million people entered the store in those 111 years and for most it was a unique experience. Even in the 1950s new customers nearly always commented on the store, its woodwork, fixtures, and throwback products from much earlier days. Entering the store, you would find the candy/tobacco counter on the immediate right. At the left was a heavily-used Boston City Directory on an easel. Next to the easel there was a long church-pew-type bench and beyond that the old dark wood and very busy telephone booth with the traditional bi-fold door. The soda fountain had formerly been located directly opposite the entrance, next to the phone booth. The fountain was installed in 1902 and the trade magazine The Pharmaceutical Era reported the event thus: “In the drug store of C. B. Rogers in Jamaica Plain, a handsome new soda fountain has been put in, adding greatly to the general appearance of the store. The fountain is of a large size, of onyx and silver trimmed.” The fountain was removed around 1948, and a refrigerated cooler holding insulin, citrate of magnesia, some chocolate items, and occasionally our lunches replaced it. The store’s fine oak woodwork included a mirrored partition with windows that separated the pharmacists from the public. The windows at either end of the partition allowed just an oblique view of the pharmacists working back there. The floor was tiled with small black-and-white porcelain tiles with a black border. Dark oak display cases ringed the perimeter and a center island showcase divided the store on the long axis running parallel to Burroughs Street. The original tin ceiling was painted off-white. Apothecary bottles, known as Label Under Glass (LUG) bottles, with various chemicals lined the shelves above banks of wooden drawers holding hundreds of non-prescription treatments and miscellanea. The pharmacists used antique scales and mixing tools when compounding ointments, lotions, pills, capsules, etc. Each and every order, whether a prescription, an over-the-counter medication, a hair-conditioning or -coloring preparation, a cough remedy, a box of chocolates or a bottle of Evening-In-Paris Perfume was hand wrapped in white paper and sealed with a stick of hot sealing wax melted in a tiny gas jet burning at the end of the wrapping counter, next to the cash register. Many hours were spent training new employees to get the wrapping and sealing just right, while avoiding setting the place on fire from the always-burning gas jet. Finger burns from the melted wax were common. Another gas jet burned in a little can-shaped cylinder atop a five-foot high gas pipe rising from the floor at the tobacco counter. After a gentleman selected his cigar from the box the clerk presented to him, he was handed a trimmer to cut the end off, obviating the standard bite-and-spit practice out on the street. Then he would slide open the little door on the cylinder and light up from the gas jet burning inside. It was all very elegant for a little corner drugstore, and something not found in any literature on drugstores anywhere. By the middle 1950s the gas jets were gone, but until then, customers were awed by these reminders of another time. One particular customer, the well-known Boston judge, Daniel W. Casey, seemed to revel in the little ritual every other evening. The pharmacists (and clerks) were always dressed in shirts, ties, and starched white jackets, even in the stifling pre-air conditioning summer days. A huge portable fan blew a hurricane from the front of the store but we still sweated mightily to maintain C.B. Rogers’ decorum. In the early 1950s the pharmacists included owner Jack Lewis and brothers Jack and Tony Montalbano — who later left and opened their own store in their hometown of Everett calling it Whitehill (Montalbano) Pharmacy. Martin Davis, another pharmacist, was as conscientious and careful as they come, especially if he suspected a patient was abusing a prescription medicine or even the over-the-counter-but-still-potent stuff like paregoric or a certain patent cough medicine that carried a heavy dose of codeine! Martin regularly challenged suspected abusers and often refused refills for that reason. A lanky, very serious, balding man with glasses perched on his nose, sat with long legs crossed while hunched over an old fashioned book-keeper’s lift-top desk as he prepared, in a beautiful hand, the monthly statements for the many Rogers’ Charge Account customers. This was Jack Lewis, whom many thought was Mr. Rogers, an appellation that caused Jack to shrug shyly with just a trace of a smile breaking across his rather patrician face. Jack’s fine writing — entering the date, the items purchased with the prices shown as exponents — extended to totals tallied on an old Burroughs mechanical calculator at the far right of the pre-printed statement form. He would stop his bookkeeping only to answer the phone, as no one else dared answer it unless Jack directed him or her to get it. Thin, or more accurately, skinny, Jack surprisingly had a sweet tooth with a fondness for chocolate-covered peppermint patties, but just the white, not the pink wintergreen ones. A tall, kindly man with great professional bearing befitting an old Yankee pedigree, Jack Lewis was the essence of C. B. Rogers drugstore and preserved the culture and tradition of the place as it no doubt had existed since its founding in 1867 by a middle-aged Charles B. Rogers. Notwithstanding his role as owner, he did all the same chores and covered the same shifts along with his staff of pharmacists. He was a gentleman through and through. Other pharmacists included Gerry Scollins who later had his own store on Hyde Park Avenue and a young Louis Principe who came aboard but didn’t stay long. In 1956 Roy Ciapciak from Buffalo, NY, was hired and he stayed until 1965 with time out for a stint in St. Louis until his wife, Mary (Dolan) got homesick for Jamaica Plain. In 1965 he opened Windsor Pharmacy in Norwood. He closed that store in 1984 and worked at Hospital Pharmacy, Norwood, for 20 years. Now retired, Roy remembers an older pharmacist named Dempsey and several clerks including Tom Cloherty. As so many others do, he remembers Jack Lewis as the best he ever met and his working experience at Rogers was unmatched anywhere. Bill Sullivan of Charlestown joined the store in about 1957 after a few years working for the Liggett’s chain in downtown Boston. He and his wife Mary moved to West Roxbury in 1961. He was mercilessly shot while lying on the floor in 1975 during one of the five hold-ups in his time at Rogers. He had complied with all the robber’s demands but it wasn’t enough, and the robber shot Bill as he was lying face down on the floor. Bill never worked full-time again and he carried the bullet to his grave in 1997 at age 82. Mary Sullivan recalls Bill’s love of the store, its owner and the family atmosphere of the place. His light-hearted humor and quips are still remembered. In 1959, Ed Carey from Mission Hill and later Kingsboro Street entered as a clerk. He obtained his degree and became a pharmacist in 1963. He left in 1971 for his own store in Lakeville (Mass.) which he ran for 25 years. He remembers the hand printing of the prescription labels after being entered in the prescription ledger books. He also recalled Rogers’ unique price code using symbols for digits to disguise the actual wholesale cost of the medicines. He fondly recalled the Christmas window decorations and the busy Christmas sales of cameras, film, perfumes and some long-forgotten brands of cosmetics. Sally Donovan, ca 1952, photo courtesy Sally Donovan. Sally Saliunas was born in 1924. She grew up in Pennsylvania and attended Duquesne University where she earned B.S. and R.N. degrees. She tried to join the Army in 1951 but was rejected with flat feet. The Air Force accepted her and she served seven years, including 15 months from 1951 to 1952 evacuating patients by air from a “MASH” hospital outside Seoul, Korea. She is therefore a combat veteran. 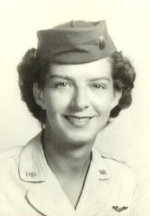 Among the highlights of her military life was flying in the same transport with John Eisenhower, the president’s son, and being awarded the Air Medal. She met her future husband, John Joseph Joseph [sic] Donovan, in the service. They were married in 1958 and lived initially in Roslindale before moving to Jamaica Plain. John worked as a staff pharmacist at Rogers from 1965 to 1970. In 1970 he bought the store from Jack Lewis who retired to Cataumet, Mass. Starting in the 1970s, under Donovan’s ownership, the store experienced a sharply different Jamaica Plain social environment. There were numerous attempts to pass forged prescriptions, several break-ins, and five holdups including the one when Bill Sullivan was shot. It got so bad the glass windows at the pharmacists’ work area were replaced with bullet proof glass and a security guard was on duty in the store during all open hours. The toll on Donovan’s health and the decline in morale in the store were significant and along with the pressures of the super drugstores’ buying power, the 12-hour days and the constant fear, John decided to close the store in 1978, selling off the fixtures, inventory, and equipment. John then took a job at East’s Pharmacy in West Roxbury, but trouble followed him there too. The owner of that store was convicted of selling prescription drugs “under the counter” through one of his employees to the illegal drug community. John’s brush with the FBI in that case hastened his retirement. Later clerks included the Darcy brothers, the King Brothers, the MacCormack brothers, and Tom Cloherty. Janice O’Hara Murray worked there as a clerk during her high school years. For Janice, her time in the early 1970s, during the Donovan years, became a family affair. During the school months she worked part time, going full time during the summer, as did her sister Joanne O’Hara along with their friend Jeannie King. Joanne’s future husband, Gerry Martell, was the deliveryman handling that chore with John Donovan’s 1967 Mustang. Gerry’s parents, Betty and Gordon Martell, were also clerks. Geoff McCarthy was the store’s business manager. Janice O’Hara Murray fondly remembers John Donovan’s compassion for his customers, his long hours, his willingness to stay open for a late-arriving prescription customer and his concern for his employees. She and her sister often helped John with his Christmas shopping for his daughter at Erco’s Toy Store. They knew just what toys were hot that year and that made John the wise Santa. The 1950s cosmetician, Mrs. Lee Labonte, originally from Brockton, ranked above the clerks and was free of most of the clerks’ more mundane duties. Lee lived on Perkins Street. “Ma” Barker as cosmetician replaced her later. Ma had worked at Carroll’s across the street and was thoroughly experienced in the world of beauty products. On Saturdays, with a full crew aboard, the junior clerk would retire to the cellar with the week’s list of “running low” items jotted down each time a sale produced an imminent shortage of that item on the shelf. That chore would take a couple of hours filling up milk crates from the backup supplies on the shelves down in the cellar. The boxes would then be lugged upstairs where every available hand pitched in to get the replacement items to their respective shelves as time between customers allowed. Conversely, when the excelsior packed boxes from local drug wholesalers Gilman Bros. or McKesson would come in, the junior clerks would check off the items on the packing list and proceed to stock them either in the cellar storage, or on the store shelf, wherever they were needed. The excelsior, wood-fiber packing, was highly flammable and had to be disposed of quickly. A newly-hired clerk had to spend the first 40 or so hours removing, dusting and re-shelving every one of the thousands of different items in stock as a way to learn the stock. I remember vividly in my second week on the job, in my starched white jacket, shirt and tie, a customer asked for a very obscure item and to the pharmacists’ surprise I went directly to the shelf where it resided and proudly returned to wrap it for the customer. The pharmacists and senior clerks were duly impressed as I was, and am, to this moment. While the minimum wage in 1950 was 75 cents an hour, part-time clerks’ pay was about 50 cents an hour, and it would be paid in cash, laid out in little piles on payday near Jack’s bookkeeping desk and stool. The pharmacist’s salaries, estimated at about $2.25 an hour, were placed in small envelopes so that the rest of us couldn’t see what they were making. Another duty of the junior clerk was to pick up a special order of drugs at the Gilman Bros. Company, drug wholesalers who were then located at 100 Shawmut Avenue, a short walk up from Tremont Street. This was done by streetcar departing from right in front of Rogers’ store. A few minutes turnaround at Gilman’s then back to the store with the needed drugs. No ID check, no questions, just “I’m here for the C. B. Rogers order,” sign, and they’d hand it over. These pickup trips were a nice break in the regular routine and of course all expenses (20 cents) were paid. And one last thing, cash registers in those days didn’t compute the change. In 1950 there were six hospitals, thirty-four doctors, twelve dentists and twenty drugstores serving them in Jamaica Plain. There was also one farrier, or horseshoer. Two of the best-known physicians were Dr. George Faulkner whose first practice was at C. B. Rogers store about 1900, just before he founded the famous hospital, and Dr. Frederick W. Beering, Jr. who practiced from his home at 61 South Street, at the corner of Custer Street, from about 1899 to 1960. He told me at that time that he reckoned he was owed about $50,000 (a princely sum then) for his pro-bono work that often went beyond the office visit, when he would note “For my account” on many of the hundreds of Beering prescriptions I saw coming into Rogers, thus providing free medicine for the patient also. He would often kick back part of the $3 office visit fee to the kid he just examined, easing the stress of a visit to the doctor for patient and parent alike. Beering had three or four favorite prescriptions and they were used for just about every ailment known to man, but, notwithstanding his somewhat dated methods, patients would call God’s blessing upon him when handing over the prescription. They revered him despite his less than cutting-edge medical skills that were offset by compassion and kindness. Sadly, Beering was omitted in the fine Jamaica Plain history book, “Local Attachments,” by Alexander von Hoffman, an oversight I hope is corrected in a future edition. Doctor Beering died in 1965 at age 90. In 1950, the lone Jamaica Plain farrier, or horseshoer, Jimmy Lovett, operated his blacksmith shop at 10 McBride Street. His skills went far beyond horseshoeing, however, as that profession in his native Ireland was very close to a veterinarian. His son, John Lovett, recalls how his dad treated a horses’ hoof disease called “thrush” which could become serious if not treated. Jimmy cured severe cases of the disease with chemicals from C. B. Rogers. He also used Sloan’s Liniment, known as horse liniment, for horses’ sore legs. Horse liniment worked on people, too! The store was open six days a week from 9 a.m. to 10 p.m., with a split shift on Sundays. Sunday hours were from 9 a.m. to 12 noon, and then from 4 p.m. to 10 p.m. Shifts were devised to cover all open hours and as long as the shifts were covered, Jack allowed swaps as long as a note recording the swap was left on his desk. Most of the clerks worked three days a week after school and all day Saturday. Sundays were covered on a rotating basis or about one Sunday per clerk every fifth week. The Sunday split shift was covered with just one clerk and one pharmacist. I would walk home for Sunday lunch at noon and then back for the 4 p.m. reopening. On many Sundays I don’t think we took in enough to cover the light bill for the day. Filling the prescriptions involved entering it and its number in a large leather-bound ledger book and then numbering and hand writing the label for the item. Those ledger books went back to day one at the store and from time to time one of the very old ones would be used in the Centre Street window display along with LUG bottles, mortars and pestles, scales and “Show globes” filled with colored water. The purpose of show globes, large tear-shaped bottles often suspended or standing in drugstore windows, was to demonstrate the pharmacists’ skill in extracting the colors from base chemicals. An unfounded myth said that the colors were a code for an epidemic being present or not present in the community. Most of the time the prescription was for a specified number of pills or capsules which were counted manually and slipped into a glass vial. These manufactured medicines were usually made by large drug companies like Eli Lilly (1876) or Upjohn (1886). Frequently, however, an ointment, cough syrup, or other medication had to be compounded from scratch using raw chemicals and the pharmacists loved that challenge. Before the raw chemicals’ potencies were standardized in the early 1900s, pharmacists determined potency of some chemicals by determining how much was required to kill a cat, or how many flies died near a solution of the chemical. I remember that in those rare cases requiring compounding, the pharmacist would come out and present the compounded medicine to the customer in person rather than having the clerk pick it up at the “Ready” shelf. It was a nice touch and the pharmacist was justly proud of his preparation. It’s interesting to note that in the 1920s, 80% of prescriptions had to be compounded or made by the pharmacist. By the 1940s only 26% required compounding and by 1971 only 1% of the prescriptions were actually made by the pharmacists. Rogers’ long history and reputation for pharmaceutical expertise brought many calls from other pharmacists seeking advice in compounding unusual prescriptions. This assistance often required reference to Rogers’ extensive library of pharmacology books. Doctors frequently called seeking a particular drug’s specifics, availability and possible interactions in the days long before today’s computers can quickly produce that information. However, I recall a prescription calling for pharmaceutical quality “Bear’s Grease” that baffled even Rogers’ expert staff, and they had to call someone in Wisconsin to find it. Fifteen to twenty prescriptions a day was about average in the early 1950s; a very busy day in the “cold” season would see thirty to forty. Compare that to the hundreds of prescriptions waiting to be picked up at your local big-box drugstore today. In 1967, at its centennial, Rogers filled its two-millionth prescription as noted in a plaque awarded by Lederle Laboratories that is in Sally Donovan’s collection of Rogers’ memorabilia. There was a significant impact on store traffic when Ed Hanlon moved his shoe store from the corner of Seaverns Avenue to the second floor directly above Rogers. Countless people would come into Rogers looking for Hanlon’s and after their shoe-buying trip would stop in for cigarettes, the phone booth, or to pick up sundries. The Hanlon family and staff were all daily regulars in the store. Much later a rare book dealer occupied the former Hanlon store and it continues there as this is written. In the 1950s new health and beauty products were making major impacts in people’s lives. They included VO5 hair preparations, Clairol products, shaving cream in aerosol cans and challengers to the Gillette line of shaving products where once “Thin” or “Blue” were the only razor blades available. A godsend for America’s teens, Clearasil, displaced older acne cures, including witch hazel, Noxzema, Cuticura soap, peroxide, non-soap soaps, vegetables and the old standby, “Drink plenty of water.” Some of the other old stuff like Vicks, Sloan’s Liniment, Old Spice, Vitalis and Wildroot hair tonic, Alka Selzer, Milk of Magnesia, etc., went on for years, but many other old- time products slipped away. Other cosmetic products including Evening in Paris, Lily of the Valley, Jean Nate products, Hazel Bishop, Estee Lauder, Max Factor, Elizabeth Arden, etc., flooded the market, and despite the very well-stocked Carroll’s (cosmetics) store across the street, Rogers did a very brisk business in all the popular cosmetics which were exploding with the phenomenal increase in movies and their starlets. Hair and other beauty products poured into the market to get a share of the growth in disposable personal income. All of a sudden, it seemed, everyone wanted to look and smell better. And despite the nearby Jones’ Camera and Gift shop, Rogers did a very nice business in cameras, film, and film processing. As a result the staff had to know the features of the various Kodak cameras coming to market and the attributes of the several different types of film, flashbulbs, and accessories. During the 1940s and into the 1950s there was still a somewhat Victorian sense of modesty or at least a much greater shyness in people. As a result, requests for male and female personal items were often whispered in hushed voices or sometimes described in a note for the item, and sometimes hand signals were used. The clerks, even at our young age, developed a keen discretion and empathy for the customer shyly ordering the personal items, which often were pre-wrapped in plain brown paper with the contents discretely penned-on in small letters. Many “browsing” customers simply waited until no one was in the store to nervously place their order. Many customers thought the “Rx” printed on the prescription form stood for Rexall, a nationwide chain of drugstores. However, it simply is Latin for “take thus,” followed by the prescribed medicine, dosage and frequency. There were a couple of large drugstore chains besides Rexall in the 1950s. They included Liggetts, Walgreen’s, and several smaller chains in the south and southwest. Through acquisition, Rexall grew to over 11,000 franchised stores nationwide. Rexall’s headquarters was at 43 Leon Street, Roxbury, presently in the Northeastern University complex. The brick Northeastern University power plant building on Forsyth Street was once part of the Rexall complex. The C.B. Rogers bottles shown here were made by the Whitall Tatum glass factory in Millville, New Jersey which was one of the first glass factories in America. They were in business from 1806 to 1938 making glass jars, vials and embossed prescription bottles for pharmacies all over America. The embossed (raised) lettering on the bottles was formed using cast iron molds shown below. Three of the C. B. Rogers bottle molds that were used at the Whitall Tatum factory are shown. 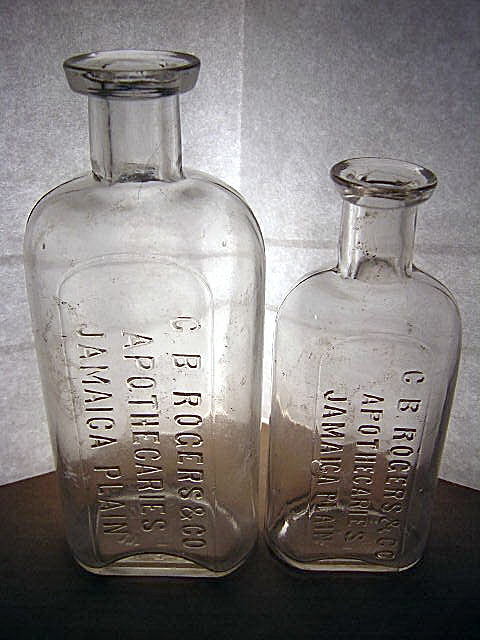 These iron molds were formed in several sizes to emboss the various prescription bottle sizes that Rogers used. Rogers was always independent but did package house brands of generic products like aspirin, paregoric, some cough medicines, laxatives, nitroglycerin, digitalis, etc. The pharmacists would dispense the bulk products into smaller, retail-size, “Rogers Drug” bottles. Occasionally, as training, the clerks were allowed to count out 100-tablet lots of aspirin and transfer them to the bottles with that old pill-counting gadget still in use today. Once the stuff was packaged, the clerks neatly affixed the preprinted labels, then wrapped the bottles in damp glassine paper, glued the seams, and twisted and trimmed the tops and bottoms. The glassine would shrink as it dried, making a skin-tight-but-somewhat-cloudy wrapper for the bottle. Other Rogers’ brand items included horehound and peppermint and molasses candy, rock candy, wart remover, and citrus of magnesia. Jack Lewis continued the Rogers’ line of products long after they were profitable in deference to his father, Ernest G. Rogers. Ernest occasionally appeared at the store well into his 80s and Jack’s affection for the old man was always very touching. The store has had additional lives after Rogers Drug including Today’s Bread, a popular restaurant for two decades. Teresa Bruce closed Today’s Bread in 1998 and Amrik Pabla opened an Indian Restaurant called Bukhara’s Indian Bistro that continues there today. Thus, the site remains viable and continues to contribute to Jamaica Plain’s culture and history. And, as I stand across the street and reminisce about the long-ago nights I enjoyed surveying Centre Street from the store’s windows, between customers, I feel very lucky to have been part of the wonderful old drugstore that anchored that corner for so long. It, more than any other experience, is my Jamaica Plain. Jamaica Plain Historical Society, 2004 Oral History by Janice O’Hara Murray. The appendices can be viewed by clicking here.